Crude prices this morning are $46.05, picking up some notable gains this morning. Crude opened this morning at $45.74, and have edged higher throughout the morning. Prices ended the day roughly $.50 higher than their opening yesterday, ending at $45.04. Prices have risen over a dollar from yesterday’s close, a rise of 2.24%. 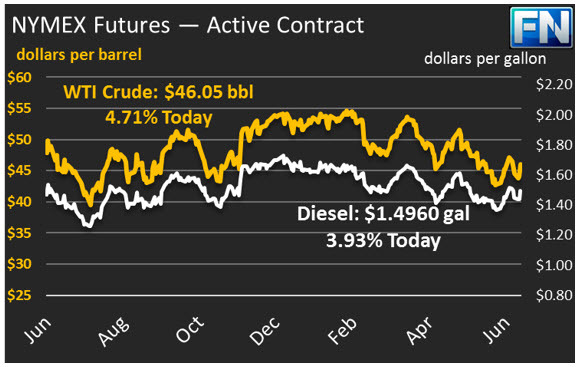 Diesel price are $1.4960, tracking crudes gains, though only rising 1.3% from yesterday’s closing price. Prices opened at $1.4899, a solid 3.5 cents higher than yesterday’s open. After two days of down-and-up prices, diesel prices seem to be relatively stable in the $1.490-$1.495 range. Gasoline prices are $1.5376, which like diesel prices was just shy of 2 cents above yesterday’s close. Like diesel, gasoline has been trading in a narrow 50-point window this morning, hovering close to $1.5325-$1.5375. Gasoline prices are roughly 2.5 cents higher than their opening yesterday. 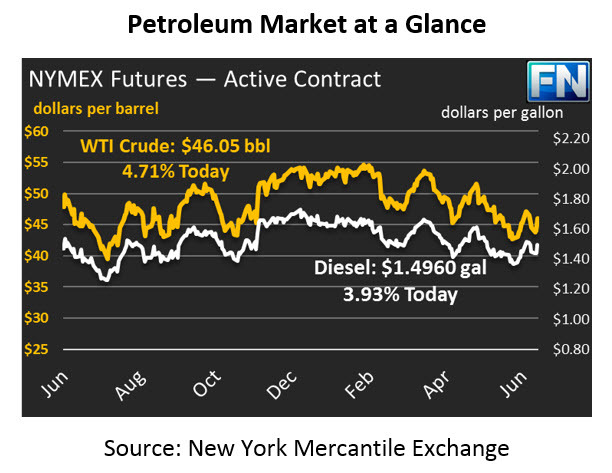 Markets are rising in response to the American Petroleum Institute’s (API) report that inventories will experience steep crude stock draws, accompanied by gasoline draws and diesel builds. The API sees crude stocks to declining by a significant 8.1 million barrels this past week, with gas inventories falling .8 million barrels and diesel stocks actually rising 2.1 million barrels. If the EIA data confirms these stats, this week will be the largest stock draw of the year, and will give prices a boost. News continue to cover OPEC dealings. The latest reports suggest that Nigerian and Libyan oil production have led OPEC exports to rise 300 kbpd (12.6 million gallons per day) over the course of the year despite cuts. Nigeria and Libya received exemptions from the OPEC deal since their oil production is traditionally so volatile, but market rumors now suggest that OPEC may be considering requiring the two exempt nations to join the cuts.